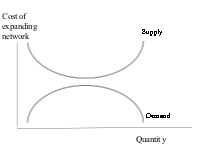 This post introduces the MUCH framework for understanding supply and demand interactions when there are economies of scale and network externalities. This has special relevance in transportation and urban economics, where both properties may exist. 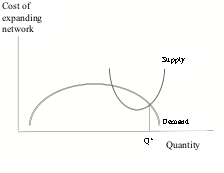 Most of introductory economics is explained according to a traditional view of downward sloping demand curves and upward sloping supply curves. 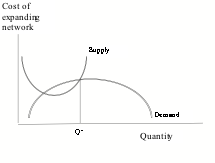 As price (on the y-axis) increases, the quantity (on the x-axis) of demand decreases. However as price increases, quantity that is supplied increases, as more suppliers are willing to sell their goods. 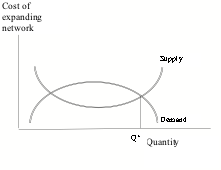 If an exchange is to be realized, these curves must intersect, which they do in the case of conventional “market goods”. We will call this a type M good. This is shown as the right-side equilibrium in Figure A or B (Figures from here, by author). While introductory economics assumed a downward sloping demand curve, we might have an apparently upward sloping demand curve. This would give us a parabolic-shaped demand curve, rising on the left, falling on the right. In this case, demand seems to increase with price. One example of this is a prestige good. Faber College‘s education must be better, they charge $50,000 per year. Another example is where prices signal something else, our research on HOT lanes showed that people apparently use price as a signal for time savings. The major case that I will use is that of Network externalities – the more people on the network the more valuable it is, so while the curve is apparently upward sloping, really people are paying a premium for a good with more members. Transportation and communications networks have these properties, ranging from telephone systems (which are more valuable if more people have phones) to airlines (which are more valuable to me if they go to more places, which they do because there are more passengers). Third we have systems that have network externalities, but without the cost savings of economies of scale. In other words, the economies of scale that exist get fully exploited, and additional users drive up costs. Cities are an example, so we will call this a type C good. The value of a city increases with more citizens, but its costs increase as well due to scarcity of land. Cities will grow so long as the increasing benefits with number of users exceeds the increasing costs with number of users. That is not to say there are no economies of scale and density in cities, for their surely are, but those are part of a lumpy system. So for instance, does multi-story development exhibit economies or diseconomies? On the one hand, the developer only pays for land once, so a high rise achieves economies on land. However construction costs increase with distance from the ground. Perhaps more importantly, usable space decreases per floor with the height of the building because of elevator shafts. A building that can be served by a single elevator loses one elevator shaft of space per floor. Once the building requires a second elevator, every floor loses an additional shaft of space. For a 20 or 30 or 50 or 100 story building, this is non-trivial. The Empire State Building e.g has 73 elevators. This is the right equilibrium in Figure C.
Finally, if we have both economies of scale or density and network externalities, we have a system that can get very large. All of the world’s successful networks are examples: telephone, internet, social networks, the airline system and so on. In the long run, free market competition or even contestability is likely to be insufficient to enforce good behavior on the owners of such Hub networks, who are likely to charge more than is welfare maximizing in order to achieve high profitability. Hence regulation, or even public ownership, is often used. This is the left equilibrium in Figures A and C. Call this a type H good. There are of course many things which, with current technologies and preferences, no-one is willing to pay enough, or the cost is too high, to profitably supply. Space travel is an obvious example. This is shown in Figure D.
It is arguable whether the left equilibria are stable, and the right equilibria generally produce more social welfare. If we are at a right equilibrium, the benefits from the scale economies and network externalities may have been fully exhausted.